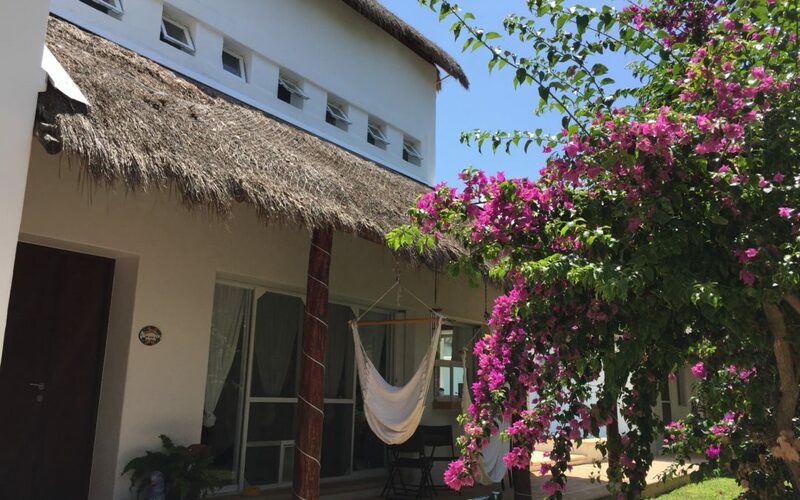 So, Gary and I have been in our new home in Puerto Morelos, Mexico for just over a week now. We arrived last Wednesday evening, and since then, we’ve gotten to work settling in to our new home & figuring everything out. There have been a few times over the past week that have been really uncomfortable, and that’s created a lot of anxiety. And I don’t know that I really considered how much all of this change was going to impact me – everything that would be changing when we set out to move to Mexico. We’re now living in a new culture, where everything is different: language, money/exchange rate, measuring system (temperature, distance and weight), and climate. This is taking a lot of thought processing, and I feel like I’m constantly translating my new experience to what I already know: 200 pesos = ~ $10; 8 kilograms = ~16 lbs; 200 degrees Celsius = ~400 degrees Farenheight; fuerte = strong. For the first few days, it seemed like everything was kind of a disaster. I realize now that I find safety in organization; so once I was able to get the stuff that we brought with us organized and put away (and still there are things that we are trying to find a proper place for), everything seemed to run a bit smoother. We’ve also started establishing a morning routine of going to the local gym, and then taking the dogs for a walk on the beach before we start working – again to create a bit of normalcy in our day.Since this was something that we did before, it makes the day feel a little bit more familiar. I am a coach who helps her clients change their health behaviors. I know that change is uncomfortable. But I also know that the more that we sit with being uncomfortable, and the more we practice, the easier our new habits and environment become. I don’t know why I didn’t expect the discomfort in making this move – but I didn’t. And so, the first few days of the move were really scary for me, and I felt a lot of anxiety. Until I realized that it is GOING to get easier. I just have to go with it. What I’m talking about here is something called the Valley of Despair. It happens whenever we choose to change something in our lives; it doesn’t matter if its something related to your health, like changing your eating habits and starting to exercise, or something unrelated to your health, like learning a new skill, for example, playing the guitar or learning Spanish. There is a point at which we feel like things aren’t getting easier. But any change that we make DOES get easier as we keep doing it, and practicing. The key is to not give up. We always think change is going to be easier than it actually is. But if you can get through the grind – the part where it just seems harder than it should be, then you can have lasting success in your goals. totally agree we are coming in sept like you scary but uplifting at the same time. Driving from Canada to Mexico finding a landing spot still deciding have the thought if not where we want move on but are committed to 3months each time. So excited but totally scary to. Thankyou for keeping it real. Have you figured out the dog food yet. Thinking we might now changing to raw diet but have to decide soon don’t want a gassy dog in our truck for the trip down lol. We brought about 60 lbs of dog food with us knowing that it would give us some time before we needed to make that decision. Last weekend we went to Costco, and there was Kirkland or Purina as the two choices – these gringa dogs have no idea how good they have it with their organic no-grain dog food (which at least keeps them gas-free) HA! Although I have to admit that they really didn’t eat much during our road trip. thanks its adventure for sure here’s your laugh for today. We are thinking about sightsee thru the states(depending on the exchange rate then) since this is a road trip of a lifetime I told hubby oh ya lets go see hmmm the big hole you know by Vegas(grand canyon) bet no one called it that lol. Our boy Koady is on grainfree too thanks for the update. I actually think that’s a great idea! Although there was a part of me that just wanted to get here, and shorten the trip, I would have loved to spend a bit of time in San Miguel de Allende, Puebla, Merida, and the Monarch forest – cause we’re probably never going to make that drive again. Sounds great, but my question, which you probably already wrote about….is why Puerto Morelos? You know, I don’t think we have. But we will. The short answer is that we had a list of requirements, and PM seemed to check all the boxes: internet, beach, close to a major airport. PLUS, we figured that even if it isn’t THE place, it at least gets us here & we can then figure out where THE place is once we arrived. Hola Amigos. Lol, yup, that’s about my level of Spanish …so far. Thanks for reaching out & the recommendation of El Pirata. We’ve never eaten there.